June 13th–Uncommon Ground, Chicago, IL, 6:30 pm; Screening & Cajun dinner–Shrimp donated by Louisiana’s Dean Blanchard and Chicago distributors John Applebaum (Penguin Frozen Foods) and Rubino’s Seafood. Wed. May 16th, 2012; 6:30-9:30 pm, Studio@620 in St. Petersburg, FL. Panel, reception and screening With Richard Knudsen, Florida Fish & Wildlife & Cathy Harrelson, Gulf Restoration Network. Jan, Mar, April 2012, Duke University’s Nicholas School of the Environment screened “Veins in the Gulf” twice–once in Beaufort, once in Durham. They’ve been working with Bayou Grace. Ted Elizabeth Skyped from Ann Arbor with her alma mater! Mar. 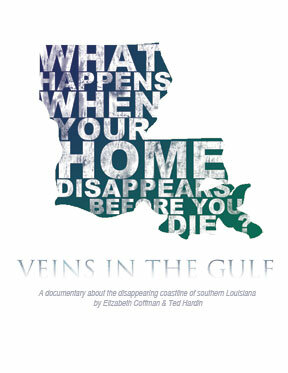 7th, 2012, 6:00 pm; Nicholls State, Peltier Auditorium, Thibodaux, LA, Martha, Ted and Elizabeth will be there! Feb. 13th, 2012, 7:00 PM, University of Tampa, Reeves Theatre.